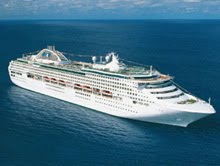 The arrival last week of the Dawn Princess in Dunedin brought the total number of visits to the harbour by overseas-owned cruise ships since 1961 to 501, according to the Otago Daily Times. The Otago Daily Times article mentions many of the other cruise ship visitors to Dunedin's Port Chalmers, including the Sun Princess, Star Princess and Volendam. And if you're interested in who builds these fantastic vessels, the article also discusses recent builds from the Fincantieri shipbuilding group -- the Queen Victoria and the new Queen Elizabeth, both enlarged "Vista Class" vessels -- and reveals which cruise ship builders have more contracts and which ones don't. Interestingly, the builders of the recently completed Oasis of the Seas, noted for being the world's largest cruise ship, have no further contracts after the completion of sister ship Allure of the Seas. Read more here.